Il Club dei Borghi piu Belli d’Italia is a tourist organisation that was set up in 2001 to promote, restore and preserve the most beautiful small villages in Italy. The countryside is full of gorgeous, magnificent old hamlets that because they are often off the beaten track don’t figure prominently in tour guides or travel itineraries. The 100 Club makes sure these wonderful Italian destinations are brought to the attention of tourists and opens their eyes to the wonderful world of the road less travelled. When deciding to take a holiday in Italy it’s easy to immediately think of the main tourist attractions. Rome, Florence and Venice automatically spring to mind, but the scenic hill towns of Umbria such as Montone and Citerna or Tuscany’s fortified towns of Anghiari and Poppi make a glorious alternative. These are places are guaranteed to leave you with a sense of the real Italy; its food, wine, people and culture even more so than the traditional travel destinations. Umbria is especially lucky in this respect and the evergreen land locked province on the Italian peninsula contributes a massive 22 beautiful places of interest that should definitely be included in any tour plans. 1) Montone, this picturesque hill town over looking the Tiber Valley, despite its size, is full of history and its wonderful clear night skies made a natural choice for an observatory. Traditional craft skills such as wrought ironwork and pillow lace are also still carried out in the area and you can find many lovely produced local items to buy. 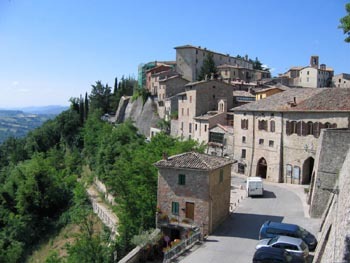 They also hold the famous outdoor Umbria Film Festival in July, which was started by Monty Python actor Terry Gilliam and each October sees the tasty Autumn Fruits of the Forest Festival enter the town. 2) Montefalco started life as a hunting lodge for Frederick II around 1249 and endured the typical Umbrian years of power struggles, battles and prosperous times. Montefalco with its Sagratino red wines is now recognised worldwide as a perfect area for viniculture and olive oil production. The magnificently planned and presented hill top town is a great place to visit while touring the province. One of the annual highlights is the colourful Infiorita Flower Festival held each June where the streets are decorated with bright floral designs made from seeds and coloured rice. 3) Deruta is an ancient town with a long turbulent history but is probably most well known as the home of Majolica pottery. 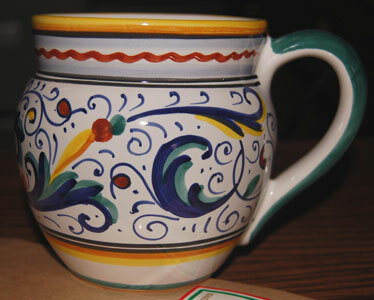 Resurgence in interest in the vibrant ceramic has led to a revival of many of the town’s old traditions. In Deruta tourists can buy Majolica ware directly from the many pottery studios around this breathtaking town in the heart of Umbria. 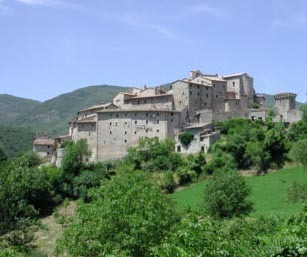 4) Anghiari at the head of the Tiber River is a glorious old citadel, which from its mighty perch looks down across the valley towards Sansepolcro. It was on this plain that a famous battle occurred and was painted by Leonardo da Vince. 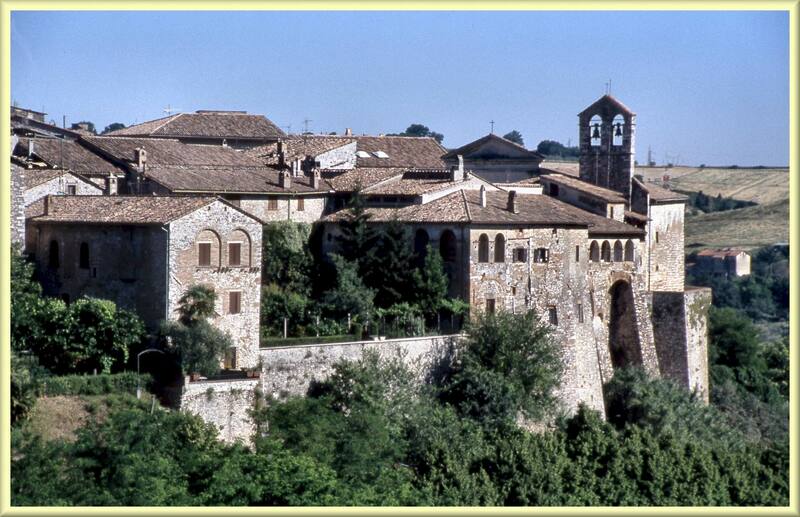 The “Battle of Anghiari” has since been lost but its story continues to be told here. The narrow, twisting streets are also home to many antique shops and restorers and makes for a lovely day out in the summer. 6) San Gemini is classified as an official “Slow City” so nothing is ever rushed here. This is a place to come and relax and unwind. Populated with dozens of ancient buildings and churches, it has been known since Roman times for its thermal spas and curative waters. Despite its tranquil exterior, in September every year, the residents of San Gemini let their hair down and host a Medieval Jousting contest. At this time the town is awash with flags, traditional costumes, parades and fighting. If you are interested in finding out more about organised and guided tours, activities and festivals around Tuscany and Umbria contact Travelling Content for more information. That’s true Mark another of Italy’s gorgeous towns. I have to admit when writing the article I kept to the Umbrian towns on the list but do intend on writing a more wider list. Love the picture on your piece.